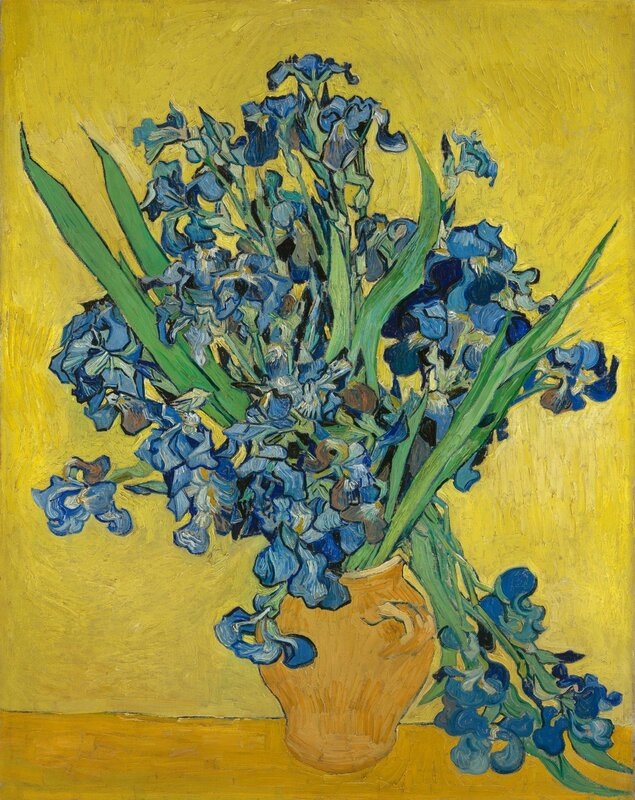 This is the first time the two paintings of irises and two of roses are exhibited together, the way van Gogh conceived them and in the order he painted them, four paintings, but monumental in terms of their importance for the history of art – like just about everything van Gogh did in his short life. Yellow and violet, pink and green — complementary colors. How strong an intensity can I achieve by cramming together colors at the opposite end of the spectrum? is a question van Gogh asked himself. And behind that: how can I convey the clashing intensities of experience? He answered with these four great flower paintings. He had just recovered from one of his violent epileptic-like attacks. Gathering the flowers in the garden of the asylum at St. Rémy — a spare room in the men’s ward was his studio — he painted them in early May 1990 just before heading north to Auvers, where he (most likely account) ended his life two months later. You may be surprised, then, that the effect of the exhibition is not one of thrilling color juxtapositions: the paintings have faded considerably, and the colors are now far from van Gogh’s original intent. He noted that paintings fade like flowers but these have survived with less of their original color intensity than others of his works because he used some particularly fugitive pigments — how quixotic. How paradoxical: he knew, but did it anyway. 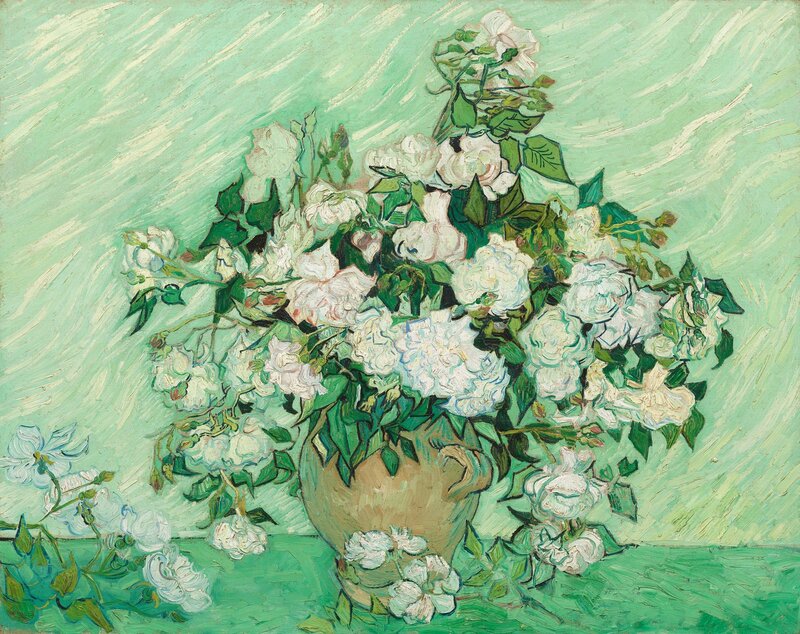 Van Gogh, Roses, 1890, o/c, 36 5/8″ x 29 1/8″ (93 cm x 74 cm), The Metropolitan Museum of Art, NYC. And they faded fast: as early as 1907, when his mother died, the once pink roses in his painting of Roses on a wall in her home were described as “white.” The fading of colors over time is clear in a montage (below) included with the exhibition of several dated images of the Roses. 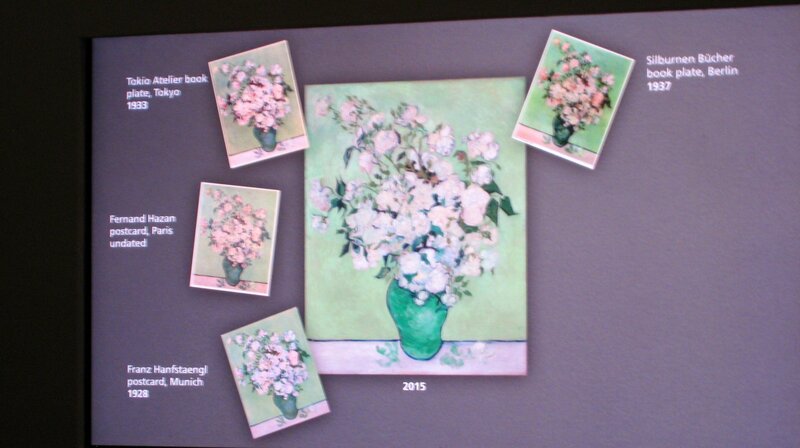 Dated photos show fading from pink to white of van Gogh’s roses (apologies for the violet tint in the photo but you can see the progressive fading in relative terms). 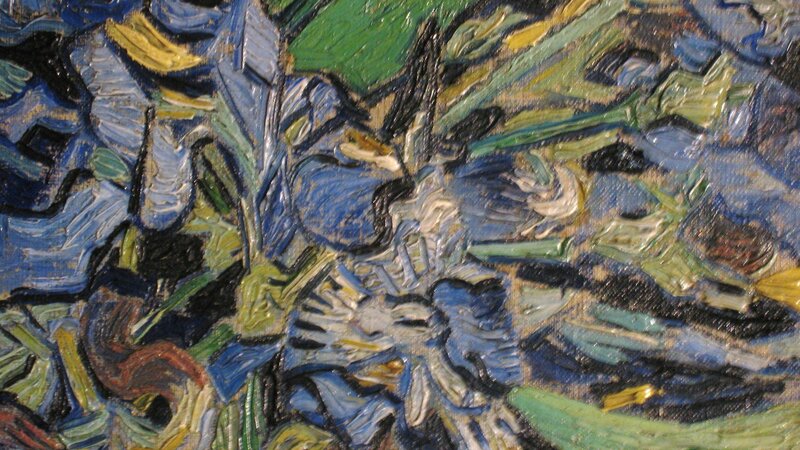 Because of their linear strength as well as color, the Irises have maintained their power better than the Roses, particularly the vertical Irises in the Van Gogh Museum in Amsterdam. The combined composition of the four paintings, together as conceived, is a counterpoint of rhythms and a teasing play of opposites. Vertical horizontal horizontal vertical, a b b a, plays off against irises irises roses roses, a a b b. He unifies the four paintings with a table edge, like a horizon line, but, as with the background, he varies the color of the table, a clear example of his sacrifice of naturalism for his expressive, even abstract, use of color. Oppositions of violet and yellow, pink and green, vertical and horizontal, spiky “male” irises and fluffy “female” roses “of a hundred petals,” linear and painterly. And life and death. Weary stalks veer off from sprightly new blooms. Through color, composition, subject content and the touch of the brush in paint, all of van Gogh’s paintings are a, symbolically, paradoxical compression of the obdurate opposites of existence. The exhibition’s organizers have taken the opportunity to document van Gogh’s careful study of color theory, and have applied scientific techniques to analyzing his pigments and practices. Their discoveries are conveyed in a fascinating series of photos and other media, the montage of the fading Roses among them. How fascinating to see a digital reconstruction of what the colors in these paintings would have looked like when van Gogh first took them off his easel. 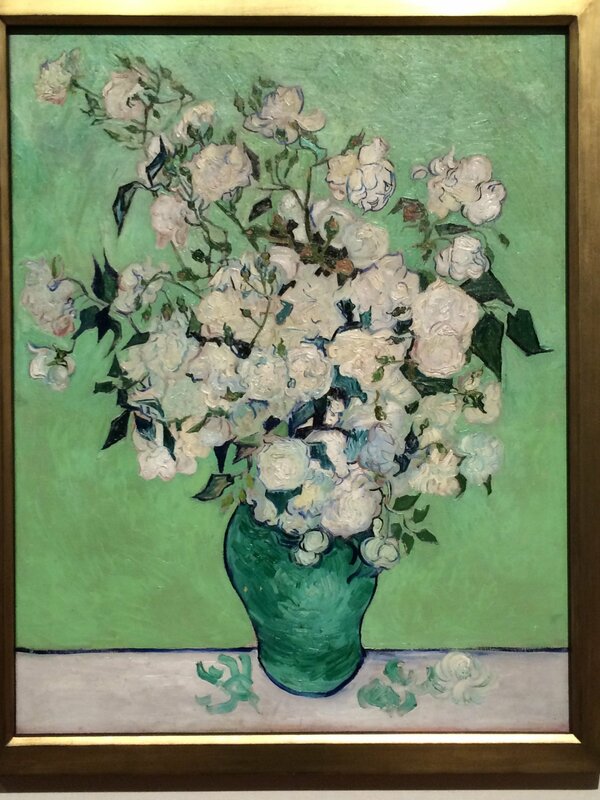 When van Gogh left the asylum in St. Rémy, three days after completing the last Roses, the paintings were still wet (what a vivid, exciting thought) and so were sent on to him later in Auvers, arriving toward the end of June. After his death, July 29th , they were dispersed. This is a once in a lifetime opportunity to see together these paintings that, like his series of Sunflowers painted in Arles two years earlier, van Gogh conceived as a whole. 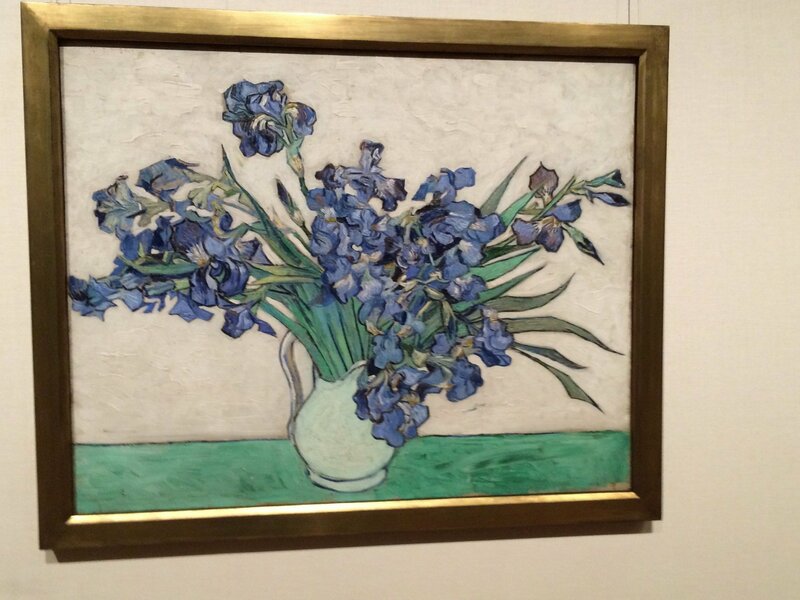 Van Gogh: Irises and Roses will be at the Metropolitan Museum of Art in New York City through August 16, 1915. Yvonne Korshak, “From “Passions” to “Passion”: Visual and Verbal Puns in The Night Café,” in Van Gogh 100, ed. Joseph D. Masheck, Hofstra University, Greenwood Press, 1996, page 40. There’s a lot more in this review than in the one I saw in the NY Times of this show. I like what you bring out about opposites, and what they mean, not just in terms of how the pictures look but in what they “say”. Deeply. There’s lots to think about here. Yes, he expresses himself so profoundly — no such thing as “just flowers” with van Gogh!